Attention to all the UK Korean foodies out there. The Korean food has become very popular in the UK, especially the street food in London. You might have spotted some of them at different parts of London. 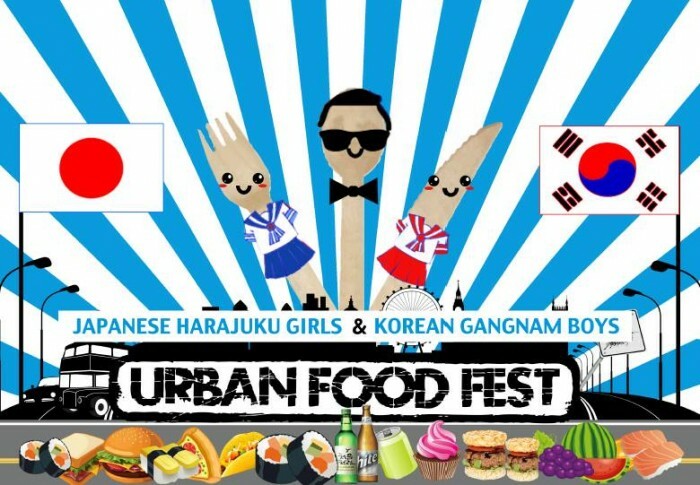 This time, every popular Korean street food stall is coming together at the Urban Food Fest with the “Japanese Harajuku Girls and Korean Gangnam Boys” theme. That’s not all, try some authentic Korean food from Yijo – Korean BBQ Restaurant including Japchae and Bibimbap. Korean Foods UK will be serving Korean Fried Chicken from their very own van. Don’t forget to try the desserts and have drinks such as Korean Hite beer and Korean Jinro premium vodka. Be sure to stop by at the Gangnam themed shot bar to grab some drinks. To make this event more exciting, there is going to be plenty of entertainment including performances by Moses (Galbi. Bros) and his mates. I have been to some of these Korean food stalls before including the ones at the Urban Food Fest previously. It was an unforgettable night. I can’t wait to go there on that Saturday night. So, what are you waiting for? Make some room for your tummies and come on down to the Urban Food Fest to eat, drink, and have fun. The Urban Food Fest is at 167-172 Shoreditch High St E1 6HU (5pm to midnight) on 3 May (Saturday). It is free entry. Trust me, it is a night to remember.